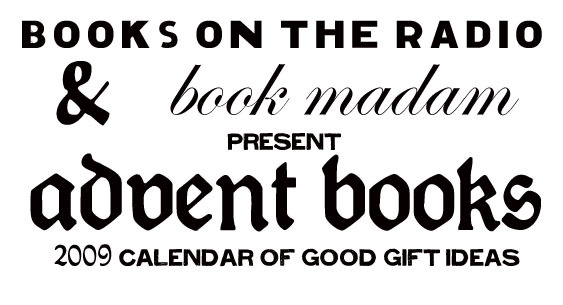 On December 1st, Julie ‘Book Madam‘ Wilson and myself, will unveil our new collaborative project, The Advent Book Blog: Great Books Recommended by Great People. The idea behind it is simple: authors, publishing professionals, bloggers, and booksellers will write short enthusiastic recommendations of their favorite books that have been published in the last year. We’ll publish a few of these every day, including pics and links for the books. We’ll also publish short bios and photos of everyone who contributes. It’s what we’re calling the Digital Handsell 3.0. Just in time for the Holiday Season. We’ve asked our participants to respond to the following imaginary scenario: You’re working in your favorite bookstore and a customer walks into the store and tells you that he/she needs a good book. A gift for a curious, open-minded and adventurous reader. The customer is someone that you’ve helped many times before and they trust your taste implicitly, but they’re in a hurry. In 25 words or less (or more, depending on your sense of restraint) what book do you recommend? What book, regardless of genre, format, relative bestsellerness, colour or shape, gets your unequivocal stamp of awesomeness? Tune in on December 1st to find out! Me and the Book Madam: We’re Cookin’ Somethin’ Up! Some of my most dedicated readers know that I’m good in the kitchen. I’m always workin’ with the heat and mixin’ the ingredients and layin’ surprise concoctions of extreme tantalization upon your tongues! Well… this Holiday Season I’m stepping away from the charcoal broiler, the freshly oiled cedar planks and the dwarf-sized oak peppermill and I’m stepping back into the ring of Bookseller. A kind of Bookselling 3.0 Digital Handsell / Best Books of the Holiday Season by the People Who Should Know – the Writers, Booksellers, Editors, Designers, Publicists and other Creators who help bring great books into the world. The irrepressible Julie Wilson aka the Book Madam (and the artist formerly known as the Seen Reading lady, who may or may not be making a surprise reappearance of her own in a certain iconic American digital periodical) is joining me in largest non alcohol related herding of book publishing professionals in Canadian History. Julie and I are working to gather some of the best people that we know in books – from the booksellers to the writers to all points on the publishing compass – to bring you their selections for the best books for gift giving this holiday season. We’ll be publishing 3+ book reviews a day on out TBA Blog. Each review will be written in 25 words or less! That’s right. Maximum enthusiasm, minimum space. Micro-reviews of the best books available to make your shopping easier. If you’re in publishing and we haven’t contacted you yet and you’re sure that we would because, seriously, what are we, crazy? Then drop me a line sean[at]booksontheradio[dot]ca. It all starts on December 1.